In most cases, when it comes to individual income taxes, the final tax return is prepared and filed in much the same way that it was when the person was alive. It is the executor’s job to file the deceased person’s state and federal returns. Often, the executor is the surviving spouse. The first step is to gather all the necessary forms and information for the decedent. This includes W-2s, 1099s, and any interest statements. 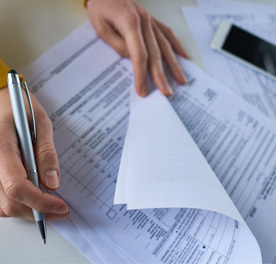 If you’re unsure if you have received all of the necessary tax documents, you can submit a request to the IRS to obtain all tax forms for the decedent. The IRS website - www.irs.gov – has many helpful tips and instructions. Visit the IRS website to find out what documents, including death certificate, you need to provide in order for the IRS to provide you with the information that you need. Once you have gathered all the forms and tax information, you will need to decide if you are filing a joint return. If the return is a joint tax return, then the surviving spouse shares the responsibility for filing. The return should be signed with a note that reads “filing as surviving spouse” in the space for the decedent’s signature. Keep in mind that if the executor is not the surviving spouse then they must also sign the return in addition to the spouse. Any income made between the start of the year and the person’s date of death should be reported on the final return. The income information will need to be listed on Form 1040 in addition to exemptions and deductions. If there was income made after the date of death then that is considered the estate’s income and will need a separate tax return for the estate if it is over $600. Once you have filled out all the required information, write the word “deceased” across the top of Form 1040. Include the decedent’s name and the date of death. You will also write “deceased” or “filing as surviving spouse” in the place of the person’s signature at the bottom of the form. If you have questions or concerns, visit a tax accountant or the IRS website.